Hexagonal Ag/Pt nanoshells were prepared by using a hexagonal Ag nanoplate as the displacement template and by introducing Pt ions. The prepared Ag/Pt nanoshells played the role of an electrocatalyst in an oxygen reduction process. Compared to spherical Pt and Ag/Pt nanoparticles, the hexagonal Ag/Pt nanoshells showed higher activity for oxygen electroreduction. In a low-temperature fuel cell, polarization often occurs at the oxygen electrode. In order to reduce the effect of polarization on the electrode, it is necessary to enhance the activity of the electrocatalysts involved in the oxygen reduction reaction. Frequently, spherical Pt nanoparticles are used as the electrocatalysts [1–3]. On the basis of the catalytic model, increasing the number of active sites on the surface of an electrocatalyst is an option for improving its electrochemical activity. Recently, nonspherical nanoparticles have also been found to be promising catalysts [4–8]. These nanoparticles promote catalytic reactions because higher atomic fractions are located at the corners and edges of the nanoparticles . Additionally, hollow metallic nanoparticles have attracted interest in the field of optics  and catalysis  due to their unique properties. We have recently found that triangular Ag/Pd nanocatalysts in an electroless copper bath exhibit high activity . The present study investigates the catalytic potential of hexagonal Ag/Pt nanoshells prepared via the galvanic displacement reaction for the oxygen reduction reaction. The method used for preparing the hexagonal Ag/Pt nanoshells was as follows. Initially, 0.05 mL of 0.05 M AgNO3aqueous solution was added to 10 mL of 2.5 × 10−4 M sodium citrate aqueous solution. Subsequently, 0.025 mL of 0.1 M NaBH4solution was gradually added to a stirred mixed solution of sodium citrate and AgNO3, and a light yellow Ag seed solution was obtained. Furthermore, 10 mL of 0.05 M AgNO3was added to 200 mL of 0.1 M hexadecyltrimethyl ammonium bromide (C16TAB) aqueous solution, and 10 mL of 0.1 M ascorbic acid and 0.266 mL of the prepared Ag seed solution were slowly dropped into the aqueous solution. Hexagonal Ag nanotemplates were obtained on adding 0.8 mL of 2 M NaOH aqueous solution to the C16TAB aqueous solution. Two hundred milliliters of the solution containing the synthesized Ag hexagonal nanoplates was precipitated by centrifugation at 4000 rpm, and the solution was then redispersed using 3 mL of deionized water to reduce the interaction of free C16TAB molecules with the synthesized Ag/Pt nanoshells. In order to prevent the interaction of Cl−ions with the synthesized nanoshells, 13.9 mg of K2PtCl4was added and slowly dissolved in a 1-mL aqueous solution of 25 mM AgNO3; white solid AgCl was obtained. The white precipitate was removed by the centrifugation method, and a 1-mL solution was then formed with a Pt2+concentration of 33.5 mM. An amount of 0.0083 mL of Pt2+solution was added to 3 mL of the stirred solution of Ag nanotemplates at a fixed controlled temperature of 60 °C. After 70 min, hexagonal Ag/Pt nanoshells were obtained. 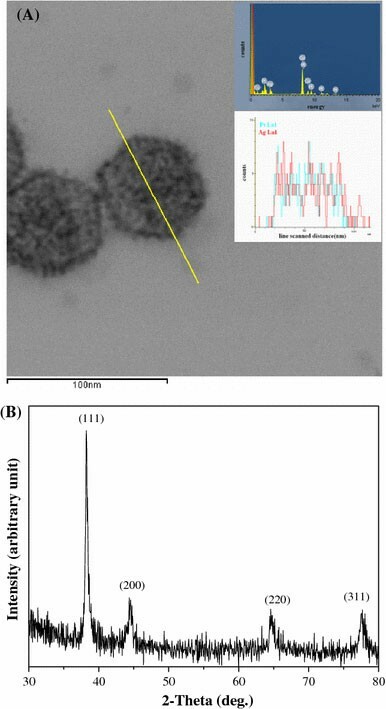 The solution containing the prepared Ag/Pt nanoshells was dropped onto a copper grid covered with a carbon film and was dried naturally; the characteristic size, shape, and composition of the nanoshells were obtained by performing observations of the dried material by using a high-resolution transmission electron microscope (HRTEM; JEOL JEM-3000F) and an energy dispersive X-ray spectroscope (EDX). X-ray diffraction (XRD) spectroscopy (Shimadzu XD-3A, Cu anode) was also employed for the analysis of XRD patterns of the nanoshells. Linear scanning voltammetry (LSV) was used for electrochemical measurements. First, 0.772 mg of carbon powder (XC-72) was added to a 1-mL aqueous solution and dispersed via ultrasonic vibration. An amount of 30 μL of the resulting aqueous solution was dropped onto a 0.07-cm2glassy carbon electrode (GCE) and heated to 70 °C to evaporate the water. Simultaneously, in order to make a comparison with the electrochemical activity of the Ag/Pt nanoshells, spherical Ag/Pt nanoparticles and Pt nanoparticles with the same Pt and Ag concentration were prepared. Fifty-microliter solutions concentrated from 1-mL solutions of the prepared Ag/Pt nanoshells, the Ag/Pt nanoparticles, and the Pt nanoparticles were dropped onto a carbon powder/GCE electrode. In order to prevent the catalyst from falling into the electrolyte during the measurement, the GCE was rinsed with 3 μL of 5 wt% Nafion solution and heated at 70 °C for 20 min. Electrochemical measurements were carried out by using a potentiostate (Autolab PGSTAT30). A three-electrode cell, consisting of a GCE working electrode, a Pt counter electrode, and an Ag/AgCl (3 M KCl) reference electrode, was used for the LSV measurement. To measure the oxygen reduction activity, the LSV experiment was performed in 1 M H2SO4(aq) solution at a scan rate of 20 mV/s. The electrolyte was purged and saturated with O2gas during the LSV experiment. Figure 1a and b presents HR-TEM images of the Ag/Pt nanoshells prepared by the galvanic displacement reaction. The images clearly reveal that hexagonal Ag/Pt nanoshells were successfully prepared via the galvanic displacement reaction by adding Pt2+ ions to a prepared solution of Ag hexagonal nanotemplates, as shown in the inset of Fig. 1b. It is noteworthy that prepared nanoshells with high order assembly (shown in Fig. 1a) were clearly observed on the copper grid with the supported carbon films. Compared to the sacrificed Ag nanotemplates (see the inset of Fig. 1b), the color of the nanoshell edge was significantly darker than that of the nanoshell center. This means that the prepared hexagonal nanoshells probably have hollow structures. The EDX was utilized to ensure that the hexagonal Ag/Pt nanoshells were synthesized by this method. Figure 2 shows the line scanned EDX spectrum obtained from the EDX analysis of a single nanoshell. The two strong analysis signals from single nanoshells were identified as Pt and Ag. The exact composition of the prepared nanomaterials was thus determined. On the basis of an analysis of the HR-TEM image, the lattice spacing of a hexagonal Ag/Pt nanoshell was measured, and is shown in Fig. 1b. One spacing was detected at around 2.30 Å. The plane distance of (111) for the Pt and Ag nanoparticles was ~2.28 Å  and ~2.33 Å , respectively. This indicates that the distance of ~2.30 Å, which lies between these two values, corresponds to a shell structure formed by the Pt and Ag atoms. Similar results have been obtained from HR-TEM experiments for mixtures of spherical Ag/Pt nanoparticles . Additional information on the nanoshell composition was provided by the XRD pattern shown in Fig. 2b. The four peaks, located at 38.25, 44.65, 64.85, and 77.55°, that were detected for the dry Ag/Pt nanoshell powders were attributed to the (111), (200), (220), and (311) diffraction planes of the face-centered cubic (fcc) structure, respectively. The diffraction peaks in the Ag standard spectrum (JCPDS No. 089-3722) corresponding to the (111), (200), (220), and (311) faces of the fcc structure are located at 38.12, 44.31, 64.46, and 77.41°, respectively. The (111), (200), (220), and (311) peaks in the Pt standard XRD spectrum (JCPDS No. 087-0644) are located at 38.69, 44.97, 65.49, and 78.73°, respectively. The locations of the peaks of the Ag/Pt nanoshells were between those of Ag and Pt. 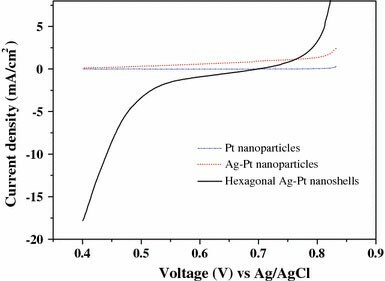 This observation confirmed that the prepared nanopowders were alloys of Ag and Pt. Figure 3 depicts LSV curves that compare the oxygen reduction reactions in which the prepared hexagonal Ag/Pt nanoshells, Ag/Pt nanoparticles, and Pt nanoparticles were used as electrocatalysts. In contrast to the spherical Pt and Ag/Pt nanocatalysts, the hexagonal Ag/Pt nanoshells showed excellent activity starting from ~0.68 V in the oxygen-saturated acid solution. In the TEM image (Fig. 1) of the hexagonal Ag/Pd nanoshells, pores are observed to form on the nanoshells’ surface. It is possible that the trapping of the electrolyte species by pores with high-surface areas resulted in the high activity of the nanoshells for oxygen reduction. Recently, Pt-based alloy nanoparticles with an optimized electronic structure were reported to show high activity for the electroreduction of oxygen . In the present study, another reason for the high activity of the nanoshells is that Pt’s electronic structure was modified by Ag during the formation of the alloy nanoshells. In conclusion, hexagonal Ag/Pt nanoshells were successfully synthesized using the galvanic displacement reaction; in the reaction, the added Pt2+ions slowly reacted with the prepared Ag nanoplates that were used as templates. The prepared hexagonal Ag/Pt nanoshells were successfully used as electrocatalysts in an oxygen reduction process. The authors thank the National Science Council of the Republic of China, Taiwan, for financially supporting this research under Contract No. NSC 97-2221-E-151-028.